Daniel Mungai’s family keeps him locked in a room in a wooden shack that is just big enough to fit a bed, a cupboard, Daniel and his wheel-chair. His clothes and bed are soaked with his own waste — and he’s been living like this for 15 years. Daniel, 35, started having seizures at a young age. He is sometimes given medicine for epilepsy and spent time at a mental hospital but his parents say they simply cannot afford to maintain proper care — they are struggling to cope. Both his parents are also now too old to help him properly. They live in the same compound in Kandara, Kenya, but in a different building. His father, Ndung’u Joroge, said: “We don’t lock him out of bad will. We lock him up because people have become very bad. He may come out here and then he is caught by young men, that is why we lock him in the house.” The desperate measures Daniel’s family has resorted to are not rare. African health services are often underfunded and overwhelmed — no more so in the field of mental health. CNN visited rural Kenya — a country where less than one percent of the health budget is allotted to mental health — to investigate the extent of the problems. Edah Maina, who runs the Kenya Society for the Mentally Handicapped, says the mentally disabled in Kenya have few options for long-term care and support. “The entire family is affected and especially when the mother sort of loses hope and resorts to locking up the child because they have to go out and earn a living or they have to chain them up because they might hurt themselves,” said Maina. Social workers in Kenya searching for those in desperate need found a mother and child on the floor of a squalid kitchen hut. John is 17 and severely handicapped. He cannot speak and cannot properly hold his head up. He has been living like this his whole life. When CNN met with him, he and his mother were lying on a thin, filthy blanket. His mother, Jane, is mildly mentally disabled. She does what she can for her son, but John spends so much time on his side that he suffers from severe bedsores. They depend on help from their impoverished family and they haven’t eaten for days. Maina said: “I think that some of these social needs are beyond the family capacity to handle the normal day to day life needs, and as you can see the burden of disability increased for this particular family when the son to this girl with mental disabilities was also born with mental disability and then the severity of mental disability of the son became more severe because the mother … is herself with mental disability.” She added: “First and foremost, nobody would want to live like this, it’s inhumane, it is not what we want to see people live, it is not the lifestyle that anybody would want. What I am saying is that this home is suffering.” Maina said that even with years of experience working with the vulnerable, the cases still shock her. Her poorly funded charity does what it can, sometimes acting on the tips of neighbors. The Director of Mental Health in Kenya told CNN that they were trying their best to help the mentally disabled and mentally ill, but that the needs were ‘enormous’ — and the funding was far too little. Dr. David Kiima told CNN there are only 50 active psychiatrists in the country to serve a population of more than 30 million. It is hard to believe that 15-year-old Joseph could hurt himself or anyone else. But he is on powerful anti-psychotic drugs and his mother and grandmother struggle to handle him. Grandmother Prisca Njeri said: “When the drugs finish he beats himself and he bites himself when the drugs finish.” She does not know what they will do when Joseph gets bigger and they have no access to proper care. When his family leaves to work on their small patch of land, they lock Joseph up in a dark room. Here, too, the place reeks. They are a loving family and are conflicted about what they have to do. “He is afraid of entering that room. 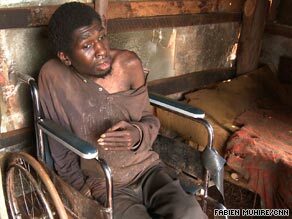 We put him in when we want to leave to go to the farm because he will get lost if we leave him outside,” Njeri said. Like so many families with limited means in Kenya, they feel compelled to make this awful decision: locking their loved ones away from society just to keep them safe from themselves and those who would do them harm.